BATTLE CREEK, Mich., Oct. 22, 2018 /PRNewswire/ -- Fans of Kellogg's® Honey Smacks® can rejoice as the beloved cereal begins rolling back on to U.S. shelves next month in limited quantities. The brand is also releasing the cereal with a simpler, updated recipe, while still delivering deliciously sweetened, honey-flavored puffed wheat cereal – making this one tasty treat fans can't wait to get their hands on. "Since its introduction in 1953, Honey Smacks has been a favorite staple in families' pantries," said Chris Stolsky, Associate Director of Marketing for Honey Smacks. "It has a deliciously sweet flavor you can look forward to every morning and we're excited to relaunch the beloved cereal to our loyal fans this fall." Honey Smacks cereal production was moved for this relaunch to a trusted and tested Kellogg-owned facility that has been reliably producing the cereal for decades. Available nationwide with a suggested retail price between $2.99 and $3.99, look out for the return of this fan-favorite cereal, clearly labeled with "New Recipe" in the top left corner on front of the box. 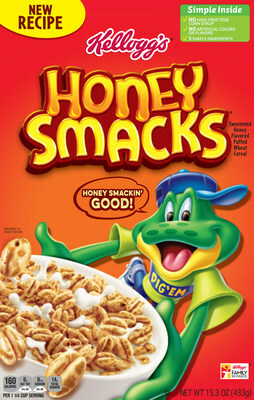 To learn more about the Kellogg's® Honey Smacks®, visit kelloggs.com.